I almost didn't want to document this story but decided to anyway as it’s a good clear warning about Toyota hand brakes and in particular the Toyota 70 series Land cruiser handbrakes! Ask any 70 series Land Cruiser owner about his handbrake and that person will 9 times out of 10 respond with "what handbrake!?". Relying on a hand brake is very dangerous and can end with disastrous consequences! A group of us (5 vehicles) at Lucky Bay just south of Kalbarri were exploring the sand dunes in some gale forced windy conditions. I turned to my left and saw my mate Torben yelling something while beeping frantically but the wind was blowing so hard I couldn't hear a word. 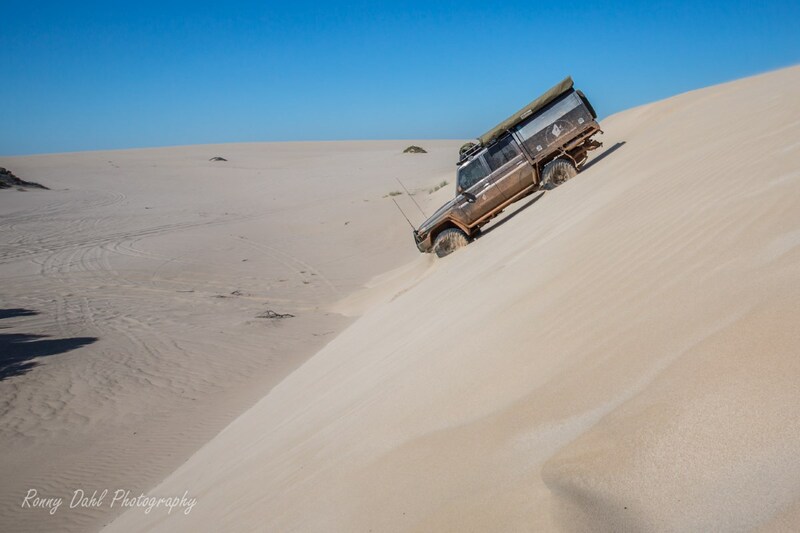 I then made out he was pointing at something behind me, as I turn around I saw my landcruiser heading straight for the steep 40m sand dune descent! At this stage the cruiser was moving at a running speed pace about 15m away from me. 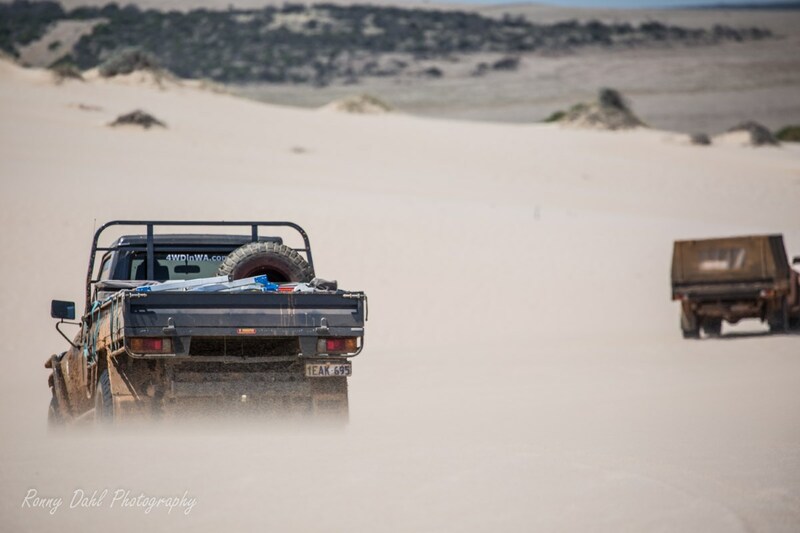 I ran like I have never run before (in sand that is) to try and reach the driver side door which was on the other side, while running I was in two minds wherever to throw the camera and just put myself between what could be a rolling Land Cruiser or just stop and watch it go! Before I made up my mind the front wheels started to turn to the left putting the cruiser on a breathtaking angle but this also slowed the speed right down until it came to a stop. By this stage I was in the cab starting her up, turning the wheels and releasing the handbrake almost at the same time and drove it safely to the bottom the last 15 m.
What a bloody scare that was! My mate Wayne approached me afterwards with a full bottle of jacks saying as a joke " Holy $thi man! I think you might need a drink to calm your nerves after that!" Let's just say the bottle was out of his hands before he knew it. When the cruiser was on the top of the dune it had the engine switched off and the handbrake up the entire way, the wind was so strong and the back of the canopy is a big flat surface for the wind to push and it eventually pushed the cruiser with such force it didn't just slowly roll it was moving at pace. Quite amazing and I have never experienced or seen wind do this to a vehicle with the hand brake on! Mind you the hand brakes on Toyotas are rubbish, everything else is great. Torben had his cruiser parked the same way and recalls having to apply the foot brake to stop his Ute from rocking and moving in the wind. Needless to say I now park the cruiser in gear and I never rely on the brake anymore, lesson learnt! 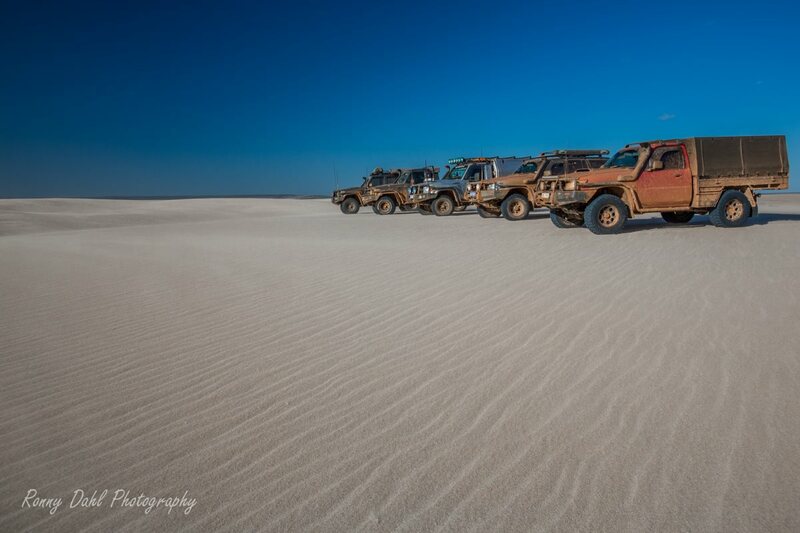 Leave Hand Brake And Go Wheeling In Western Australia.